Railroad track people know that track degradation is a complex and constant problem. Because so many variables affect track strength, correcting problems when they arise, and correcting them effectively, is no easy task. Norfolk Southern’s Research and Tests Department recently concluded a series of tests that focused on a specific track maintenance problem: rail cant. The tests compared lateral forces — the primary contributor to cant — that were generated by varying gauge, fastener type and condition, rail profiles and lubrication. In its design orientation, the vertical axis of the rail is tilted slightly to gauge, due to the geometry of the 1:40 tie plate. Any rotation of the rail relative to that neutral position is described as cant, and is measured in degrees. Rail cant develops as rail, ties and fasteners wear and their ability to resist rail rotation weakens. The source of this degradation is the high lateral forces generated by heavy-haul traffic on curves. In order to control cant, it is important not only to maintain track components at a high level, but to understand how the various track characteristics affect lateral forces. NS launched this study with a question; how does rail orientation and track condition affect lateral forces, and how are those forces best managed? Variables at play included rail cant, gauge, rail fastening systems, and friction. Phase 1 of the study took place at a test site in Wills, West Virginia, where strain gauges and video cameras captured every detail. The test site at Wills was on a 7.8-degree curve with 4 inches of elevation, and with gauge face lubrication but no top-of-rail (TOR) friction modifier. The curve had 2 degrees of cant on the high rail and 3 degrees on the low rail and gauge just under 57-1/2 in. — close to NS’s maintenance limits. Two months into the test, and in response to the deteriorating track condition, Maintenance of Way installed new tie plates with elastic fasteners on the high rail, inadvertently gauging the track to 56-3/8 in. in the process. A week after the trackwork, Research and Tests happened to visit the site and observed that the spikes inside the low rail were raised up 7/8 in. A video camera was set up to capture movement of the low rail under dynamic loading. Video 1 shows this movement under a loaded coal train. Figure 1. Wills test site: Average lateral forces, lead wheels, before high-rail plate change (trains 1 – 143) and after (trains 144 – 177). The lateral force data reported by the strain gauges confirmed the dramatic rotation observed in the field. Figure 1 shows a graph of 180 loaded unit trains, either coal or grain. The vertical axis shows lateral forces, with a scale from 0 to 25 kips. Each data point represents the average force generated at one wheel position for an entire train. Pink represents the lead wheel, high rail. Blue represents the lead wheel, low rail. At the start of the test, lateral forces ranged from 10 to 15 kips. When the elastic fasteners were installed on the high rail and the gauge was tightened, lateral forces increased a third — from the 10- to 15-kip range to the 12- to 23-kip range. After seeing the movement of the low rail, Maintenance of Way quickly installed elastic fasteners on the low rail and opened up the gauge to 56 3/4 in. Video 2 shows the same track section after the changes to the low rail had been made. Figure 2. Wills test site: Average lateral forces, lead wheels, after high rail plate change and low-rail plate change (trains 178 – 300). Figure 2 shows the dramatic reduction in forces (lead axle) following these changes. Lateral forces were cut in half, dropping from the 12- to 23-kip range down to the 5- to 10-kip range. The results generated even more questions: What caused the initial rise in lateral forces after installing elastic fasteners on the high rail? And what caused the subsequent (and dramatic) drop in forces following the installation elastic fasteners on the low rail? Was it the gauge or the cant? Or was it the type of fasteners? To answer these questions, NS set up a second test site at Hardy, Virginia. The track conditions at this site were similar to those at Wills: a 5.7-degree curve with 3.5 in. of elevation, 57-in. gauge, gauge-face lubrication and no TOR friction modifier. The cant angles were the same — 2 degrees on the high rail and 3 degrees on the low rail. The 3 degrees of cant on the low rail was troubling. Because of the dramatic spike lift seen at the Wills site, 3 degrees of rail cant was understandable. But at Hardy, there was no plate cutting, and the rail spikes were almost down tight; the reasons for 3 degrees of cant were not apparent. Figure 3. Hardy test site: Rail base to rail seat contact was occurring only on the field side of the rail seat – to the left of the red arrow. A bit of digging with a ballast fork answered the question. There was significant tie plate / rail seat wear. The yellow arrow in Figure 3 indicates an area on the tie plate with greater than 1/8 in. of vertical wear. The red arrow indicates the hinge point — a point of inflection between no wear on the rail seat on the right, and the worn surface on the left. This type of wear changes rail cant geometry. The conventional wisdom is that the rail rotates about the field-side base, and that 1/8 in. of tie plate lift is equivalent to 1.2 degrees of rail rotation. But when there is a worn rail seat, the point of rotation changes. Now, 1/8 in. of tie plate lift on the gauge side works out to 2 degrees of rail cant. So, the 3 degrees of cant on the low rail made sense. Despite not having the spike uplift seen at the Wills site in Video 1, the amount of rail cant at Hardy was still significant. Video 3 shows the rail base-to-worn-rail seat contact at the Hardy test site (see Figure 3) under train traffic. To investigate other ways to manage lateral forces, NS introduced a new variable to the Hardy site: TOR friction modifier. The applicator unit was installed 1500 ft. from the curve on the approach to the test site. Figure 4 shows trains 600 through 1200. The TOR friction modifier was active only between trains 900 through 1050. Figure 4. Hardy test site: Average lateral forces, lead wheels, with TOR friction modifier applied for trains 900 – 1050. Lateral forces reflected the status of the TOR applicator unit: from 10 to 15 kips with the unit off, down to 5 to 10 kips with the unit on, then back up to 10 to 15 kips off. With the TOR applicator unit deactivated, NS continued testing with focus on a different variable: the replacement of the worn tie plates with new 8 x 18 in. tie plates with cut spikes. 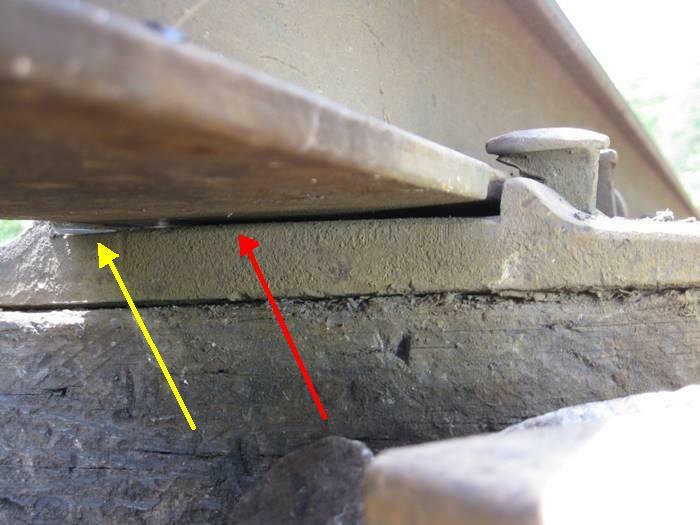 Due to the wear pattern on the low rail (see Video 3), the worn tie plates had nearly 3/16 in. of vertical wear on the field side of the rail seat, and little to no wear on the gauge side. Figure 5. Hardy test site: Average lateral forces, lead wheels, with new tie plates installed under low rail at train 2270. Figure 5 charts the lateral forces on worn tie plates for trains 1700 to 2050 and the effect of the new tie plates for trains 2275 on. Forces on the lead axle dropped from the 10- to 15-kip range down into the 5- to 10-kip range. Video 4 shows the same section of track seen in Video 3 after the installation of new tie plates. At Wills, lateral forces dropped from the 12- to 23-kip range to the 5- to 10-kip range because of several variables: elastic fasteners, worn tie plate replacement, and gauge correction. At the Hardy site, forces in the 10- to 15-kip range came down to the 5- to 10-kip range with the application of a TOR friction modifier. Replacing the worn tie plates achieved similar results; forces went from the 10- to 15-kip range to the 5- to 10-kip range. The data seem to show that there are several strategies for damping lateral forces. The solution depends on the context of the problem; for example, rail cant at one site may not stem from the same problem as rail cant at another site. But it is clear that lateral forces can be managed by paying attention to a number of track maintenance variables, including tie plate condition, type of fastener system, gauge, cant, and friction, as well as their interaction with each other.